Game is played with 2-4 players. 72 word cards to read- 12 cards for each vowel pattern. Game board, 2 spinners included. COLOR and BLACK AND WHITE version available! 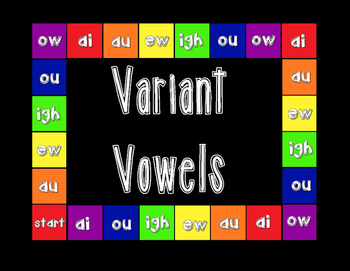 Start by separating the colored word cards into six piles (red, orange, yellow, green, blue purple). Put the label above each color -> ai = red pile, au = orange pile etc. 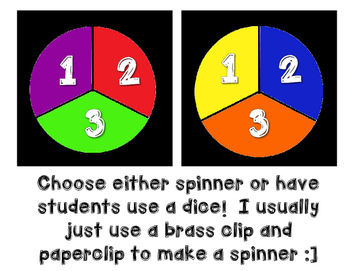 Players spin or roll dice to see who goes first. Student with the highest goes first. Student rolls/spins. They move forward that many. When they land on a spot, look at the vowel pattern on that spot. Then, pick a card from that pile. Student has to read that word. If they read it correct, they get to keep that card. Student 2 takes a turn and so forth. If a student cannot read the word, they place the card on the bottom of the pile so someone else can have a chance there. 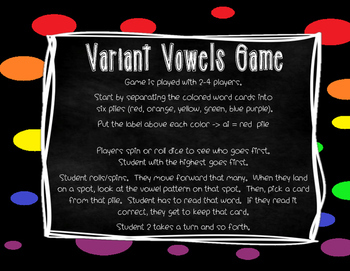 If a certain vowel pattern runs out of cards, then that color is closed off for the game and nothing happens when a student lands there.